There are several brands out there when it comes to aftermarket air intake systems, but Injen leads the way in innovation, efficiency, and power gains. 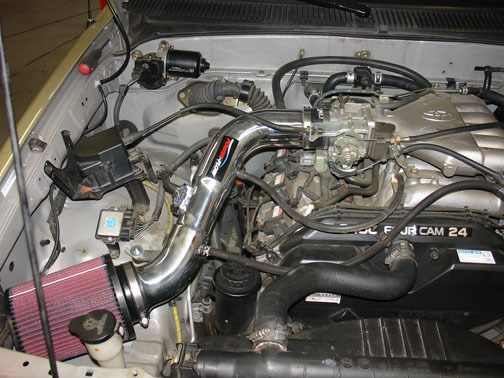 Injen PowerFlow Intake Systems are more than just a high flow air filter on a less restrictive tube. Featuring Injen's patented MR Technology, Injen incorporates a step process into their intake tubes (meaning they increase or decrease the diameter of the intake tube at strategic points to control airflow). This, coupled with the fact that Injen Power Flow Intakes incorporate your existing sensors, mean you won't have any check engine lights and it is safe for use on your vehicle. This "Factory Tuned" design means you won't need any tuning and makes this truly a bolt on system. At the end of the Injen PowerFlow Intake is the Injen High Flow Air Filter Element, which is protected from heat by an aluminum heat shield. The Injen air filter that can be cleaned and reused for as long as you own the vehicle. An air stabilizer and incorporated velocity stack smooth out airflow to help maximize power gains. Comprehensive installation instructions including photos make installation of your new Injen Intake easy enough to do yourself with basic hand tools in under an hour. Everything you need to install this air intake is included. Injen Power Flow Air Intake Systems exceed OE standards and as a result will not void any existing factory warranties that you may have. Additionally, you'll enjoy increased horsepower and torque, as well as improved throttle response. Fuel economy gains, especially during freeway conditions, are commonly achieved helping the unit to pay for itself over time. The part number for this item is PF2055P or PF2055WB (depending on the color) and fits 1999-2004 Toyota Tacoma , 4 Runner 3.4 V6 models. We get this question all the time� Which Injen Air Filter should I pick?? Here at New Level Motor Sports we like to provide you with options. That�s why we are one of the only Injen retailers who gives YOU the choice as to which Injen filter you want: The Injen Oiled Filter (K&N Style) or the Injen/AMSOIL Dry Filter. Injen Intake Systems are available with two different kinds of filters: Dry and Oiled. The Injen Oiled filter is a K&N Style filter. It is a pleated filter that features 5 layers of filtration. It allows for significantly more air flow than OE air filters. The filtration rate on oiled filters is over 98%. Oiled filters need to be cleaned periodically (every 10-20k miles, depending on the conditions you drive in) and will need to be reoiled after the cleaning. You can purchase a cleaning kit from an auto parts store, or we sell the cleaning kit here on our website. The Injen/AMSOIL Dry is an oiless filter that can be cleaned with a shop vac, which makes cleaning much easier than the oiled filter. The filtration on the dry filters is over 99%, so they are slightly more efficient in terms of filtration. There is no difference in horsepower or torque between the wet and dry filters. The main difference is your personal preference. Some people love the oiled filters and others love the dry filters. Either one is going to work fine and they are 100% interchangeable (if you have a dry filter and later want to replace it with an oiled filter or vice versa you can do so). We recommend the dry filter over the oiled filter due to its ease of cleaning and slightly better filtration. Also, with a dry filter you don't risk fouling your mass air flow sensor by over oiling an oiled filter during cleaning. This Injen Power Flow Intake is 50 State street legal. If you are in California, a SMOG technician may ask you for a CARB EO number proving this intake is California emissions approved. The CARB EO Number for this intake is: D-476-6 This EO number should already be stamped on your Injen Intake unless the sticker has fallen off or was removed.